(Newser) – In what may be one of its more unusual Facebook posts of 2017, the police department in Pawhuska, Okla., has reported on an incident that took place Friday in a junior high school choir room. 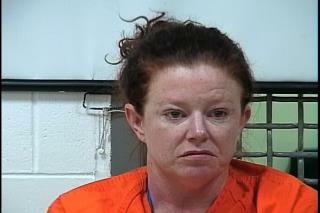 The alleged perp, per KOTV and the Smoking Gun: Lacey Sponsler, a 34-year-old substitute teacher. The purported crime: showing off her cartwheel skills sans underwear. Per a probable cause affidavit, a 17-year-old female student says that Sponsler had announced she wasn't wearing undergarments, as well as dished about using drugs and how "14-year-old boys were like men." Then, captured in a video cops say a student shot on a cellphone, Sponsler allegedly did a cartwheel and caused her dress to "[flip] up," showing her buttocks. I thought all teachers even substitutes were fingerprinted and their arrest records checked. If they had an arrest record, that would prevent them from being teachers. At least here in Texas, they are.